I love cleverly named shops, and Turn Me On Art definitely fits the bill! 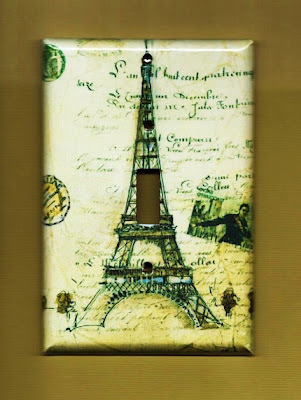 They create the best light switch plates for your home! When I was choosing mine, I wanted an entire handful :) I loved the Little Red Ridinghood plate, but I ended up going with the Vintage Alice in Wonderland design. I thought it would be perfect for my closet light, seeing as how my closet is a bit of a wonderland itself! Turn Me On Art is generously giving away a light switch plate of the winner's choice! For a chance to win, please visit Turn Me On Art and leave a comment here with your favorite item. *Congratulations to our winner, Amy! 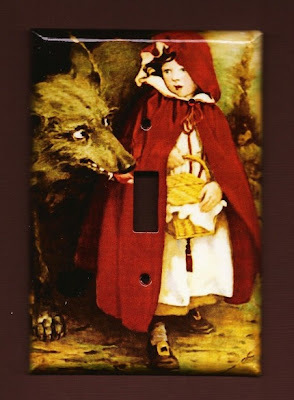 I think that Little Red Riding Hood may be my favorite as well, but I also love The Crow Switch Plate cover! The White Bird from Turn Me On Art captured my heart! Very cool wall plates! It's hard to pick just one as a "favorite", but in the sport of play I'll go with your "Respect Mother Earth Switch Plate cover." Wow, I just LOVE those!! I like the landscape ones and the Reduce, Reuse & Recycle ones. Would be soo cute in many parts of my home! I love the Forecast Blue Skies and Blossoms light switch cover. I love the Double Swarovski Crystal Switch Plate cover. 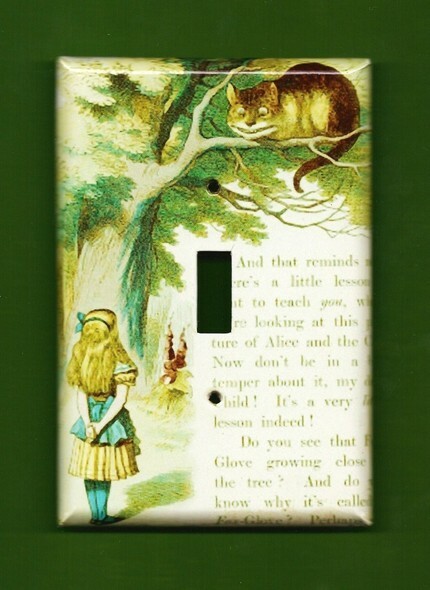 I love their Butterflies are Forever Switch Plate cover, beautiful! Have to admit the Red Riding Hood one is so cool too. Thank you! I would love to have the Oriental Blossoms switch plate! They are all great. I like the Eiffel tower for my bedroom decor. My favorite is the green and gold double switch plate cover! I love the Lotus Double Switch Plate Cover-would look so pretty in my kitchen. the crystal chandelier one is my favorite. I'm a new follower of Haute Whimsy! Definitely the paisley. So cute! hello and greetings from maryland! the landscape II light cover would look great im my guest room! thank you for a chnace to win! i like your fbook page! I adore "Ding Ding the Witch is Dead"..it was tough to choose a favorite! I LOVE the Hokusai Wave one. Gorgeous. Butterflies are forever - very nice. I love the Butterflies are Forever Switch Plate cover. "Light bulb" is my favorite--WISH it were a double so I could use it at the office! My favorite is the Oriental Blossoms plate. I like the contemporary landscape swirl. I would love the Alice in Wonderland one! I like the Lotus Double Switch Plate Cover. I like the yellow birds switch plate cover. Ooo I love the paisley switch plate! I really like a number of these, but finally decided my favorite is the Oriental Blossoms (single) switchplate. I like the Humpty Dumpty switch plate. I like the butterflies are forever switch plate. Little red is my absolute fave! But, since it's here my second fave is the double switch buddha. I like the "Light Bulb" Switch Plate cover. Thanks! I really like the Hokusai Wave Switch Plate cover. love the light bulb switch plate cover! Forecast Blue Skies and Blossoms is my favorite-so pretty! Way too many awesome plates-I really like the Oriental Blossoms and the Black bird switch plate cover.. I really like the blue skies! These are AMAZING! I'd probably go with the Buddah Double Switch Plate cover. Ding Ding the Witch is Dead is AWESOME!!! That is by far my favorite movie ever. I like the Butterflys are forever. i love the birds on the wire! My favorite is the Lotus double switch plate! oh gosh, I think I like the Yellow Birds Switch Plate cover best! I love the only chandelier I can afford single switch plate! Chandelier with Background Design is my fave. The blooming lotus is gorgeous!